'One Hundred Harvests', water miscible oil on food recycling bag material with silk thread, 2017. 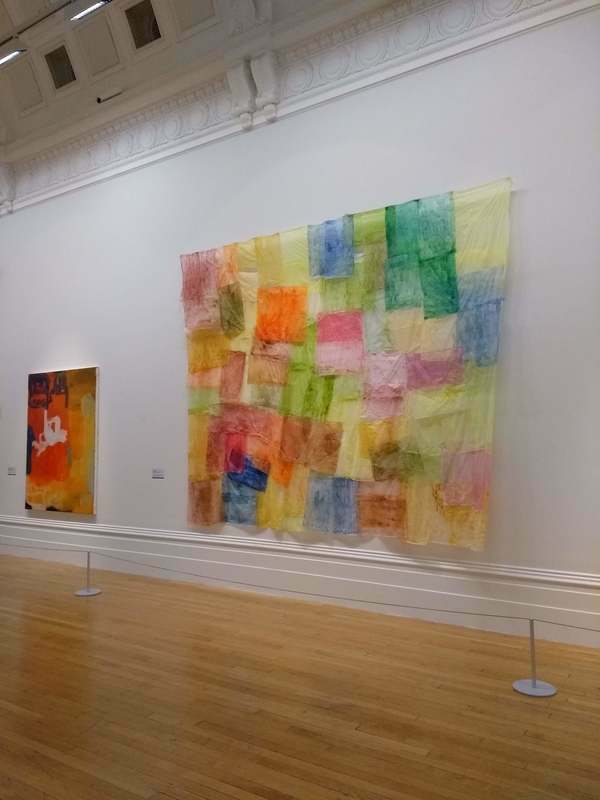 Shown installed in the John Moores Painting Prize Exhibition, 2018, at the Walker Art Gallery, Liverpool. This piece is painted on the material used for food waste recycling bags. Made from crops such as corn or potatoes, it is produced in order to throw away food waste, and is designed to break down in the process. I find this material fascinating as it seems to me to embody conflicts embedded in our attitude towards food resources. It is fragile and ethereal and floats like parachute silk with the movement of the air around it. Visually I was inspired by Paul Klee's water colours exhibited in 'The Nature of Creation' (Hayward Gallery, 2002), painted around 100 years ago. The title of the work references an article ('Ploughing on Regardless', George Monbiot, Guardian, 2015) about how modern intensive agriculture has degraded our farmland to the extent that it may only support a further one hundred harvests.